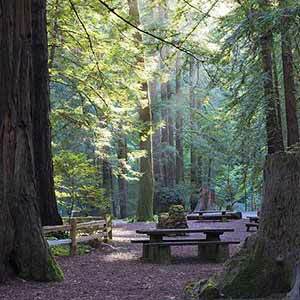 Point Reyes is a rural backwater of endless deserted beaches, lushly wooded hills, dairy farms, and scenic small towns, preserving an entire section of the Bay Area in an undeveloped state. The park is a popular attraction with both tourists and locals, getting a staggering 2.5 million visits per year, although it doesn’t really seem that crowded. Most of the park’s trails are in the hilly, densely-wooded southeastern half of the peninsula. The lush woods, especially on the coast side of the central ridge, are by far the most scenic in Marin County. In contrast, the rural western half of the park is dominated low scrub-covered hills with active dairy farms; although this area has fewer trails, it does have the best beaches. 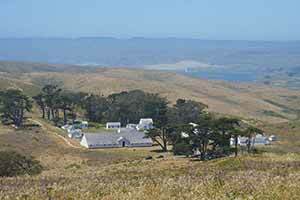 Although Point Reyes has a lot of great scenery, there’s no one “must-see” attraction. The most popular trail is the Bear Valley Trail, but it seems to be popular mainly because it’s close to the visitor center and easy to hike; the scenery isn’t especially interesting. 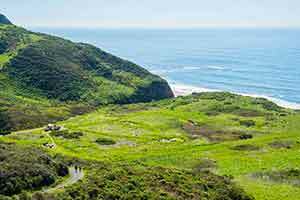 Better scenic highlights include the Point Reyes Lighthouse, Alamere Falls, the Giacomini Wetlands on Tomales Bay, and, of course, the beaches. 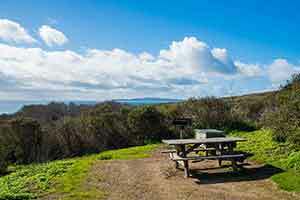 The most popular of the park’s many beaches is Limantour Beach; thanks to its connections to nearby trails, there are some nice walks in this area. The huge, remote, west-facing Point Reyes Beach is relatively little-visited, in part because it’s so foggy and windswept. The east-facing Drakes Beach, by the Kenneth Patrick Visitor Center, is much warmer and more welcoming. 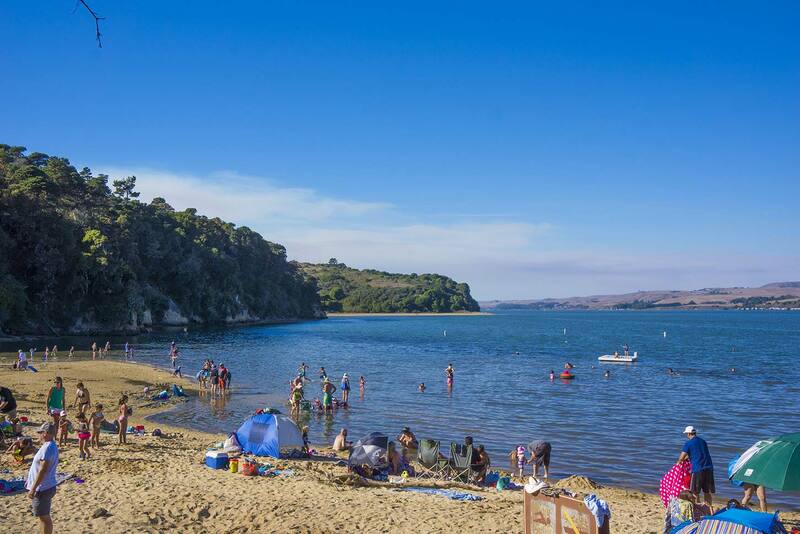 The little beaches on Tomales Bay are especially scenic; some of them are only reachable by boat and most are open for boat-in camping. Tule elk have been artificially introduced to the peninsula and can best be seen on the Tomales Point Trail at the northern end of the park, where they are confined by a huge fence. 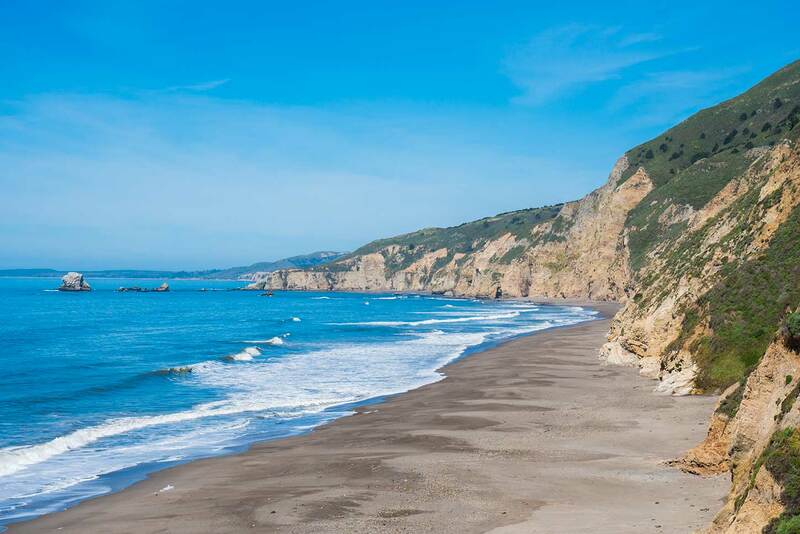 The tiny town of Bolinas, at the south end of the peninsula on the remarkably scenic Bolinas Bay, is the most attractive in the Point Reyes area. Point Reyes Station is the largest and most popular town; with a good selection of restaurants and other services it’s the most crowded spot in the Point Reyes area. 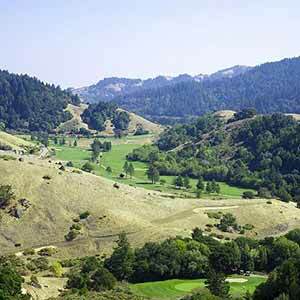 The bucolic stretch of Highway One between the two towns is one of the Bay Area’s best drives. 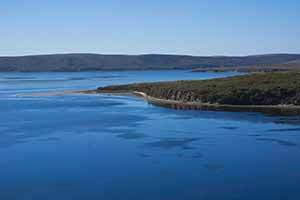 Also on the peninsula is Tomales Bay State Park, a small, lushly-wooded park with lovely views of Tomales Bay. The centerpiece of the park is the tiny but extremely popular Heart’s Desire Beach. 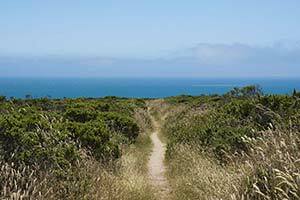 The Drakes Head Trail provides the best views of the strikingly calm, baby blue Drakes Estero, the body of water that dominates Point Reyes. 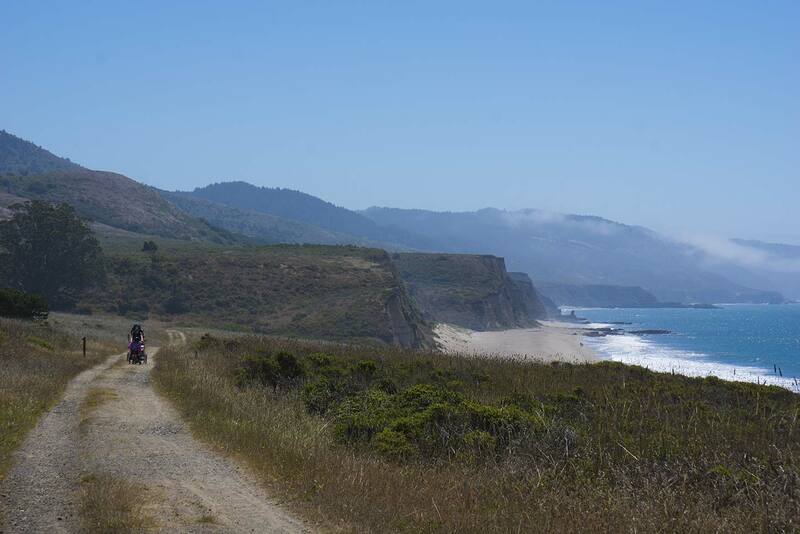 The Bear Valley Trail, which leads to the now-collapsed Arch Rock, is Point Reyes’ most popular trail. 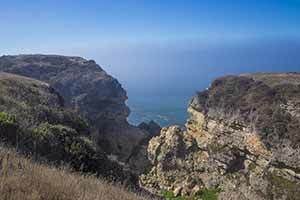 This hike combines it with a scenic loop on the Coast and Glen Trails. This loop runs over the low open hills at the border between the wooded and bald portions of Point Reyes. It’s a pleasant, quiet, and easy hike without a lot of distractions. 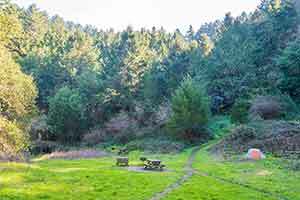 Wildcat Camp is really scenic and convenient to Point Reyes’ most popular atttraction, Alamere Falls, but it only has 4 regular sites, making it really difficult to book. 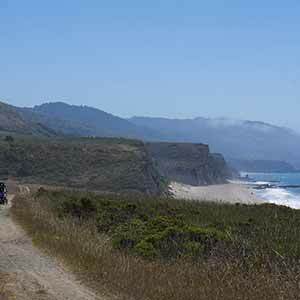 Coast Camp is on the scenic, remote Point Reyes coastline, a nice mile-and-a-half walk along the beach from the easternmost of the two Limantour trailheads. 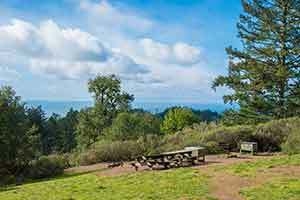 Sky Camp is on a scenic ridgetop that's covered with a mixture of lush woods and open coastal scrub. Some sites have views of the ocean and the green hills around the camp, although the views are somewhat limited by the scrub. Glen Camp is in an sheltered meadow surrounded by lush coastal woodland. It’s surrounded by miles of green conifer-carpeted wilderness, giving it a remarkably remote, backwoodsy feel.